The all-new F200 outboard engine offers the power of the previous F200 V6, but in a smaller, lighter, smarter and more efficient package. 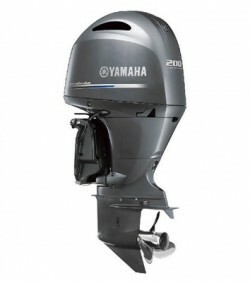 The F200G has the same engine as the F200F, but comes standard with Command Link Plus – Digital Electronic Controsl (DEC) and is fully compatible with Yamaha’s ground breaking High-Definition Command Link Display (6Y9), allowing boaters the ability to actively monitor the critical boat systems and performance of multiple outboards all from the one screen. Both models are YCOP® compatible and can be rigged to external NMEA 2000® compatible displays or analogue gauges using a gateway device. Eliminating the ‘clunk’ sound normally associated with moving between gears, Yamaha’s patented Shift Dampener System (SDS) uses a splined aft washer and a splined runner hub to absorb noise, vibration and improve reliability. This carefully engineered solution brings smoother, quieter gear shifts. With 50 amps of total alternator output, the F200 provides a 13 percent increase in power compared to the V6 F200. Today’s boats need more charging power to accommodate the wide variety of on-board electronic devices. The alternator also offers high output at relatively low rpm.